As I said in my first post, I'm a pretty much a pattern-follower when it comes to sewing. So this is a review of one of my favorite patterns. I LOVE this pattern. I love it so much that I've made four pairs of Easy Fits in 3 months. I particularly liked the tip about turning under and pressing the hems and waist casing before sewing the seams together. Forty years of sewing and I never thought of that. It is so difficult to turn under an itty bitty quarter inch for a teeny tiny sleeve casing after the sleeve seam is sewn. Much, much easier to do the turning and pressing when the sleeve--or hem or waist--is flat. Then just sew the seams...everything matches up nicely and turns under, ready to be sewn in place. And the Folding Templates that were included in the pattern for the hem and waist casing made it so easy...no measuring! I purchased the Adult Easy Fits Pants because the pattern included a wide range of sizes, Tween XXS to Adult 3X , was suitable for boys or girls, men or women and could be customized to any individual. While I have sewn lots of things for Baby Kenzie, I haven't sewn anything for 11-year-old, Erik, since his kindergarten graduation eel costume (yes, eel costume. Their little program had an under-the-sea theme). I thought this would be a good pattern to sew for him. And I planned to make some for myself, also. So one day when we're walking through Joann's, he spotted this bright, UF orange and blue camo fleece with Gator logos on it. "Gramma, make me something with this!" he pleaded--University of Florida anything is popular at their house. I thought of the Easy Fit pattern. We were going to Michigan at Christmas and some nice fleece pants would keep him warm. I measured his height and hips. His hip measurement put him in the XXS size. The "Side Length" chart gave a choice of pant lengths from shorts to floor length for different heights. There is also an option for regular or low rise. The pdf pattern was easy to put together and I had the pieces cut out in no time. The diagrams and clear step-by-step instructions were easy to follow. The only change I made was to add a drawstring to the waist. 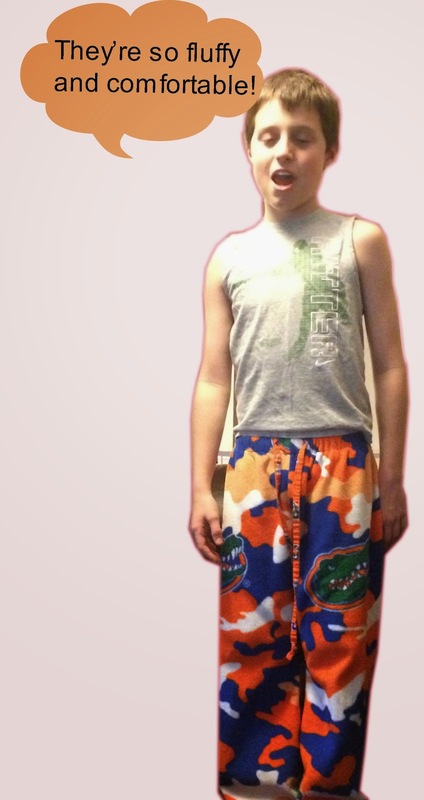 A few hours later, the orange and blue camo Gator-covered fleece pants were done. What a hit they were! He loved them! He wore them every day over Christmas vacation. He about wore them out! Erik's pants were done so quickly, I decided to make some Easy Fits for his mom. I hadn't sewed anything for her in a really long time. Orange chevron flannel for her. And a mini pair of pj pants for Kenzie in the orange chevron, too. Mommy and me pants! 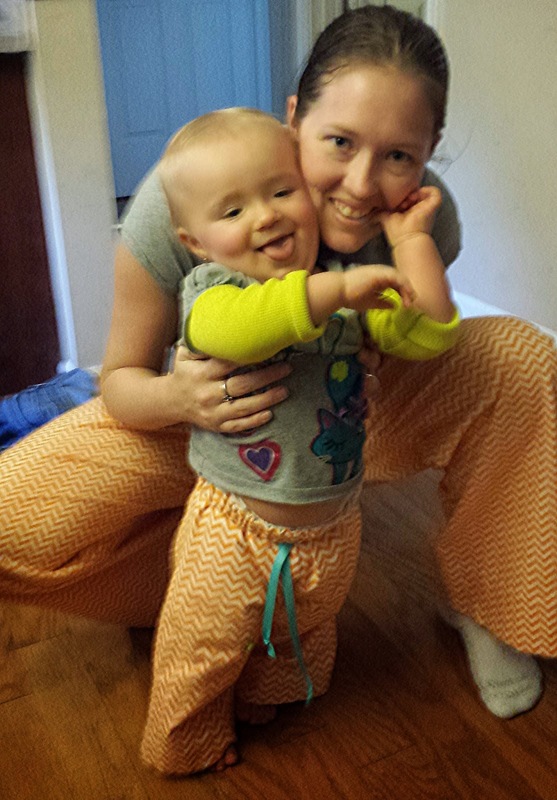 Kenzie and Mommy modeling their pants. After Christmas, I found some football fleece on sale at Joann's and made another pair of Easy Fits for Erik. He plays Pop Warner football and loves anything with footballs on it. A few weeks ago, I saw some cat patterned fabric at Hobby Lobby. A fourth pair of Easy Fits! These would be perfect for my feline-loving sister who raises the most beautiful British Shorthair cats. How cute are these little faces? When my mom saw the cat pants, she said she wanted some, too! Although not necessarily in cat print fabric! Because she's about 4'11' now, she has a hard time finding pants that are short enough. So I guess Easy Fits for her are next on the list. And, one of these days I'll get around to making some for myself!